This is our sweet precious Violet. She is the first child to her parents Amanda & Gavin and she is loved like you couldn't imagine. It is a rare defect of the heart in which a single common blood vessel comes out of the heart, instead of the usual two vessels. In babies with a truncus arteriosus, oxygen-poor blood and oxygen-rich blood are mixed together as blood flows to the lungs and the rest of the body. As a result, too much blood goes to the lungs and the heart works harder to pump blood to the rest of the body. She is in very good hands in Toronto's Sick Kids Hospital. When she was just a couple of days old, Violet had corrective surgery but it will not be the last for her. 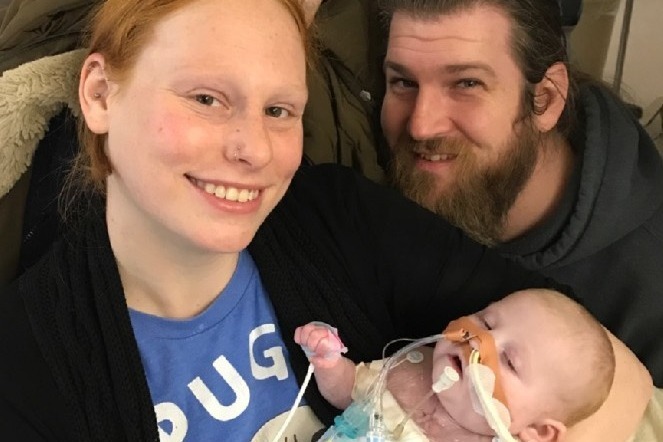 Violet is a redhead (like her parents), and you know what that means...she's a fighter! Her surgery was very successful and she is now slowly being weened off the heavy medication and equipment that has helped her body heal after such a serious surgery. She is progressing well, but will be dealing with this throughout her life. This surgery is a temporary fix and as she grows, her heart will also and she will need more surgeries. Right now the costs are piling up for this new little family and they have more on their plate than a lot of other first time families do. Daddy works, but is on parental leave so he can be there with his little one that needs him so much right now. Mommy has medical issues also and has to take care of herself too. Amanda (Violet's mommy) is also recovering from a C-section and giving birth which has kind of thrown her diabetes (type 1) out of wack and she has developed kidney issues. She requires insulin regularly and wears a glaucoma sensor to help monitor her insulin. She also had developed pre-eclampsia and requires medication that they do not have coverage for. It was a tough decision to create this Go Fund Me, because asking for help sometimes is hard and can be humbling. Amanda, Gavin and baby Violet are lucky to have loving family help them as much as possible, but costs are climbing for them. * Ronald McDonald House: Thank goodness for Ronald McDonald house. They provide rooms for $15/night...but even that can add up when you have other bills and are not working. *Medication: Baby's medication is covered, but mommy's medication is not. They were able to pay for this when working, but that is getting more difficult. It is unknown when baby Violet will be released from the hospital and able to come home. As much as her parents would love that to happen, it cannot be rushed. It will happen on little Violet's terms and when she and her little body is strong enough and ready. It will be a while, but she is a heart warrior! Baby Violet's parents would love to hold her and hug her often, but these interactions have been and are difficult and limited due to procedures and machine hook ups or if they get sick they have to stay away. They have had to be very patient and are always very positive. Just imagine not being able to hold your child or bring them home. Amanda and Gavin have more than enough to deal with at this time and it would be awesome if they did not have to worry about money issues on top of it all! Please help them out, no amount is to small and is greatly appreciated! I can not believe that Violet will be 6 months tomorrow, and what a long 6 months it has been! Gavin & I have been on a rollercoaster ride of emotions, to say the least. However, we are ecstatic to announce that as early as Monday, Violet Fleur Baril will be making a giant step closer to home, figuratively, as well as physically! We are going to Mac! That's right, Violet is being transferred to McMaster Children's Hospital in Hamilton. Violet is completely off all opioids, her chest is healed and ready for tummy time, and she is only on breathing support for a small amount of time each day. We are still waiting to have more tests done to see where she is at currently, heart function wise and neurologically. She has had a physical assessment of her neurological development and seems to be doing very well though. P.S. remaining funds will be used to secure reliable transportation to be with Violet, as well as a saving fund for Violet. Since the last update, Violet has continued to improve! Her chest wound still has a ways to go before it is healed, she did develop an infection but it has since been treated. Violet also had a vacuum put on the opening of her stitches to help heal and prevent further infection. The vacuum was taken off yesterday and the doctors are discussing putting more wires in her sternum to help close the bottom part of her wound and doing a skin graft. She is also being weaned off meds slowly, meaning she is more and more awake and aware everyday! We are also able to hold her now! Since the last update Violet's chest has been closed. It was hard to get the stitches in as her skin integrity has degraded due to her being open so long, this has resulted in the stitches opening up a little, but so far this has been manageable and holding up. Once Violet was closed, she needed to be suspended to releave the new pressure on her heart. Violet had a hard time the first time the doctors tried to desuspend her, she was too swollen and had not adjusted to being closed. She was desuspened and managed to support herself for about 5 hours before it became too much for her. Again the doctors told us that this maybe as far as she could go, that she may never be able to handle the pressure on her heart, but they would give her a few more days to get the swelling down and adjust to the closure. Violet has now been desuspened since 2:30pm on Monday the 17th of December. She has been awake and moving around, looking amazing! I'm sorry it has been so long since the last update, we have been waiting for good news. 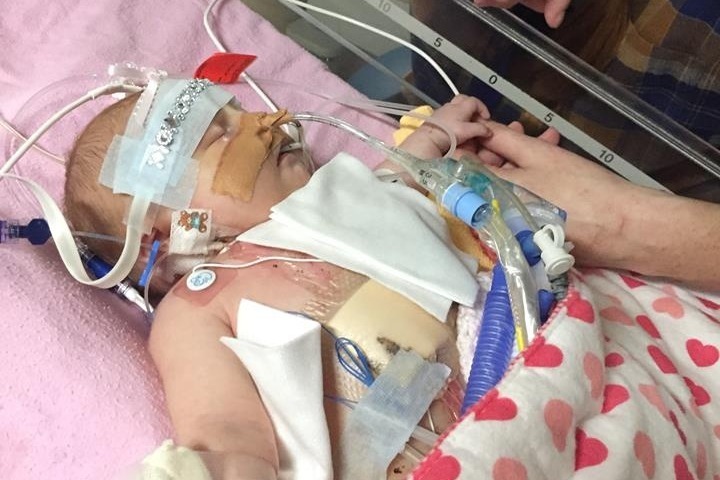 After her second heart surgery, Violet went into cardiac arrest again and was placed back on the ECMO machine. 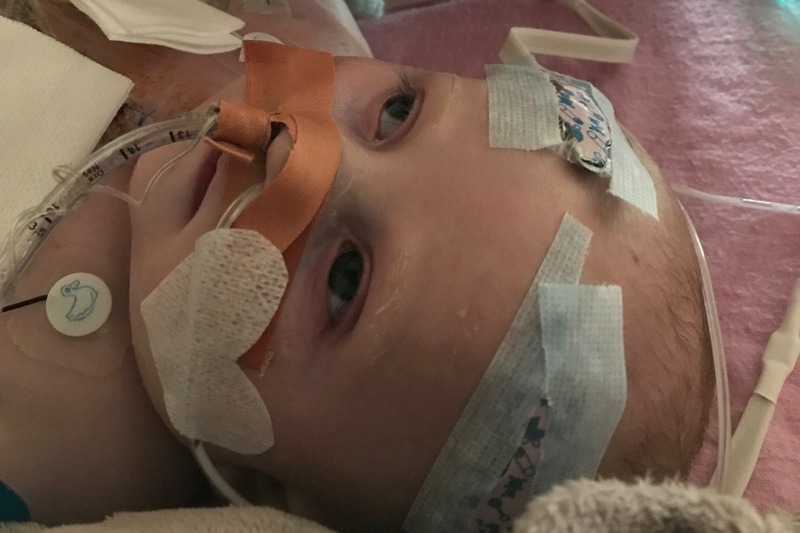 During this time doctors preformed tests on Violet to assess her status, due to the first heart attack Violet has sustained severe damage to her heart and brain. Due to her young age it is unclear what this truly means exactly for her future. 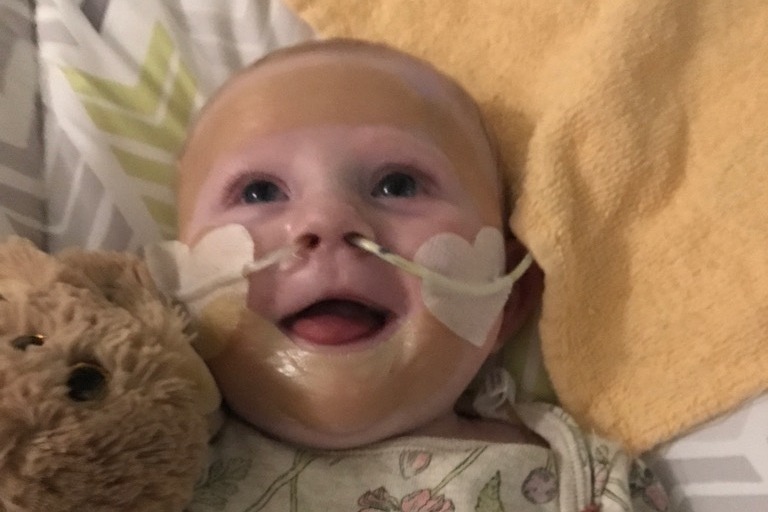 Violet's doctors also came to the point where they have done all they can do to prepare Violet to sustain herself and outlived the benefits of the ECMO machine. What this meant was Violet had to come off the support of the machine despite the fact she hadn't made a lot of improvement in heart function and had no more procedure options left if she ran into trouble. I am pleased to say that Violet has been stable off the machine since Tuesday, December 4th. She still has a long way to go, odds to defeat, and her chest remains open but we remain hopeful that our beautiful baby will come home.